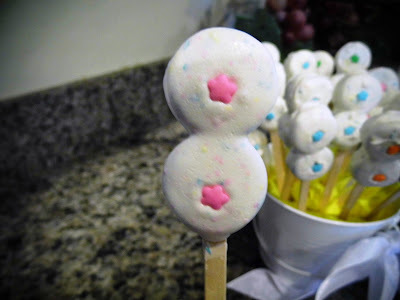 I've been wanting to try the dipped oreo pops floating around on pinterest. I was in charge of treats for my niece's baptism, so I came up with my own version of oreo pops to create a number "8" for the occasion. It's just two mini oreos on a flat craft stick, dipped in melting chocolate. I used some flower sprinkles I already had for the centers of the "8". I think using an M&M would be even better proportionally, but I forgot to get them at the store, and didn't want to make another trip with the 3yr. old! Next time! To make these, I opened up each oreo, lined up two, placed the stick on the frosting side, squirted a little of the chocolate on like glue, then put the tops of the cookies over that. I then put them in the freezer for a while before dipping them. I used a spoon to help get them coated with the chocolate, then put the sprinkles on while the chocolate was still wet. I put them back in the freezer so they would be solid. 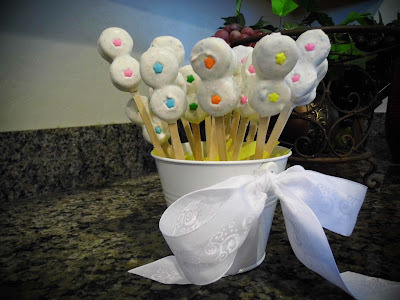 They were a hit at the baptism party and tasted so yummy!